Tucson itself is a diverse 300-year old city, encompassing nearly 600 square miles. Habitation can be traced back to agricultural settlements along the Santa Cruz River dating from 1000 B.C. Surrounded entirely by four mountain ranges with heights above 9,000 feet, and the lushly vegetated Sonoran desert, Tucson boasts a distinctive southwestern look and enjoys more than 300 days of sunshine each year. The almost perfect Tucson weather has for many years enticed visitors to remain! Metro-Tucson has a population approaching one million. Business and recreational opportunities abound. Just an hour away from the United States/Mexican border, Tucson’s population is both multicultural and international with influences reflecting the richness of the Southwest. Describing Tucson, Arizona in 50 words or less is easy: spectacular weather, unique landscapes, rich culture, easy access to every leisure activity on land or water, a well-educated populace, casual lifestyle, affordable quality housing, low cost of living, world-class healthcare and a thriving business environment! Tucson is one of the top five best bicycling towns in the U.S. Tucson was voted "friendliest city" and one of the top ten U.S. cities to visit High desert climate and surrounding mountains allow swimming, hiking, and skiing -- all in the same day. Tucson is one of the few U.S. cities its size that can boast of a symphony, ballet, opera and several live theater companies. Tucson is conveniently located 97 miles from Phoenix, 204 miles from the gorgeous beaches of Mexico, 257 miles from Sunrise Ski Resort in northern Arizona’s White Mountains, 338 miles from the Grand Canyon, and 409 miles from San Diego. Tucson is the home of the University of Arizona, one of the nation's top 20 public research institutions. The U of A offers world class instruction in fields as diverse as astronomy, plant science, biomedical science, business, law, music and dance. Tucson, dubbed "Optics Valley", has more than 1,200 high-tech cluster companies employing 50,000+ people and generating annual revenues greater than $6.0 billion, Evidence of Tucson's high-tech activity includes its ranking of 14th in its high-tech manufacturing output, placing Tucson ahead of San Diego, Las Vegas, Salt Lake City, Albuquerque, and Phoenix. Tucson’s business infrastructure is built to support any company and the low costs for labor, materials, utilities and more are among the lowest in the United States. 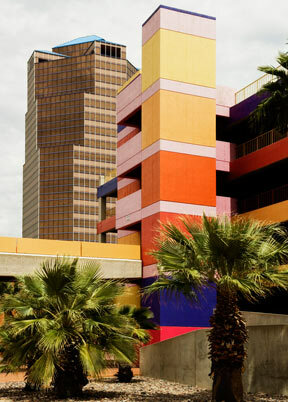 Tucson, Arizona is also referred to as a “mini-Mecca for the Arts”. This can be readily illustrated by the numerous arts organizations found throughout the region.